The next time I’m getting ready to head out of town for a few days on business–especially if I’m looking at an 8 a.m. departure–will somebody please smack me in the head if I start to install a preview release of an upcoming Microsoft operating system on my work laptop? Thank you. That would have saved me a lot of Windows-inflicted misery on a night I needed to go to bed early. This week’s travels took me (again) to San Francisco, where Google hosted its I/O 2012 developers conference from Wednesday through Friday. I did a quick interview with Washington’s WTOP news-radio station about the opening-day keynote; a streaming copy of my spot is a little down the page on the above link, or you can download the MP3 directly. The weekly CEA column revisited an old argument in the music business–would you need to actually own music if you had reliable, on-demand access to everything you’d want to listen to? I like how this post turned out, but having it land an hour or two before the Supreme Court’s upholding of the Affordable Care Act probably didn’t help it win readers. So about that day-one keynote: I’ve seen some enthusiastic audiences at Apple product launches, but nothing quite like the response to Google having four people jump out of an airship over San Francisco, livestream their descent via Google Glass eyewear, and then land on the roof of the Moscone West convention center. 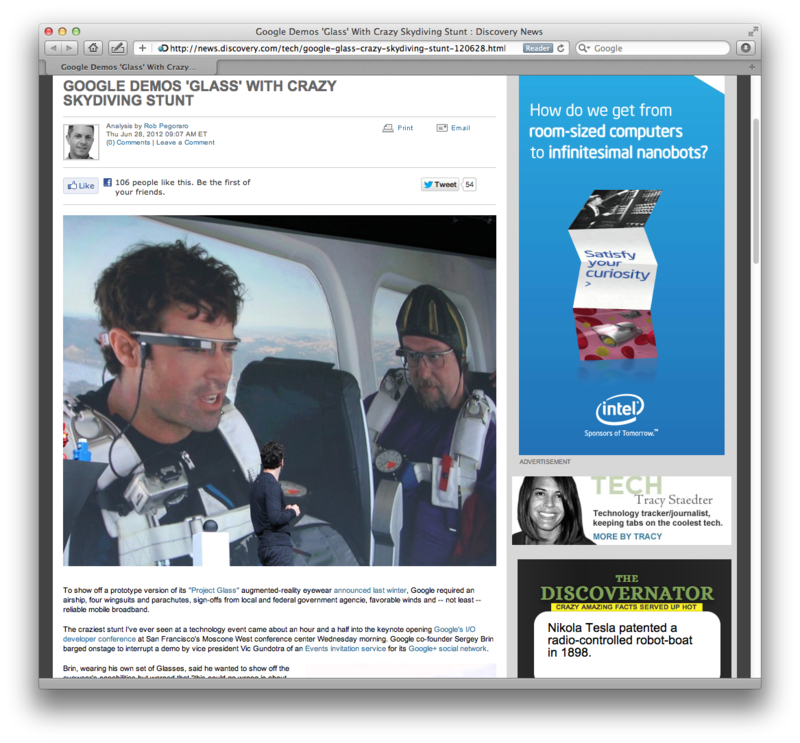 This post provides some details about how Google pulled off this stunt (it’s the first time I’ve had to quiz a Federal Aviation Administration rep for a story) and the Glasses themselves (Google vice president Vic Gundotra mentioned that his prototype model doesn’t last as long on a charge as his phone). This follow-up post recapped Google’s five major consumer-focused product debuts at I/O 2012: the Jelly Bean version of Android possibly coming, possibly soon, to an Android phone near you; the Nexus 7 tablet; the made-in-the-USA Nexus Q media streamer; Google+ Events; and Google Docs offline editing. The weekly Q&A unpacks Verizon’s new “Share Everything” smartphone plans and offers a first-look review of the offline mode Google added to its Maps program for Android. Note that if you read this story Sunday morning, it’s since been changed to fix two errors that readers e-mailed about: I had AT&T’s $20 data option including 200 megabytes of use, not 300 MB, and I wrote that Google Maps offline availability required Android 3.0 or newer when the far more widely-used 2.3 release will suffice. This entry was posted in Weekly output and tagged #io12, android, Google Docs offline, Google I/O, Google Maps offline, Google skydive, Google+ Events, Jelly Bean, Nexus 7, Nexus Q, Project Glass, Share Everything, Verizon Wireless, VzW, WTOP by robpegoraro. Bookmark the permalink.